Palm Beach, Fla. – March 26, 2019 – Barrett-Jackson’s Endorsed Insurance Program will celebrate its 10-year anniversary during the 17th Annual Palm Beach Auction from April 11-13, 2019, at the South Florida Fairgrounds. Introduced in 2009, Barrett-Jackson’s best-in-class Endorsed Collector Car Insurance expanded to include policies for homes, daily drivers, watercraft, aircraft, motorhomes, jewelry, memorabilia, weapons, fine art and more. 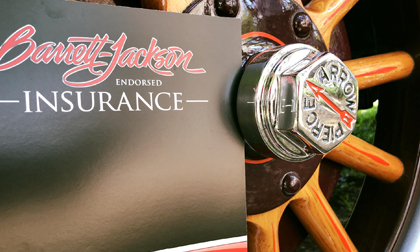 The Barrett-Jackson Endorsed Insurance Program includes several insurance providers who meet each client’s unique needs, with AIG Private Client Group serving as the primary carrier. The program is managed through Jim Schwarzkopf, co-founder of the Program and Chief Sales Officer at BridgePoint Risk Management, formerly TDC Risk Management. Headquartered in Maumee, Ohio, BridgePoint is geographically positioned to serve its clientele with additional satellite offices in Greenwich, Naples, Palm Beach and Phoenix, and representatives coast to coast. The company is licensed in all 50 states and also has international capability. Through AIG, a collector car policy includes up to 150 percent Agreed Value at the time of a total loss, meaning market appreciation will be considered. Diminished Value is also included, which takes into consideration market depreciation after a partial loss if the vehicle losses value. Unlimited roadside and towing, automatic 90-day coverage for physical damage/30-day automatic coverage for liability, client’s choice of repair facility, first right to buy back the salvage and worldwide coverage territory round out the outstanding policy offerings from AIG Private Client Group. Visitors to the upcoming Palm Beach Auction can find out more from representatives of Barrett-Jackson Endorsed Insurance on-site. Click here to view the complete 2019 Palm Beach Auction docket. For more information on becoming a bidder for the 2019 Palm Beach Auction, follow the link to www.Barrett-Jackson.com/bid. To submit an application to consign at the 2019 Palm Beach Auction, click here.